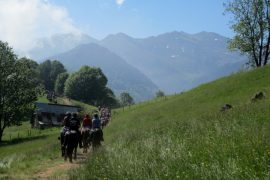 This 5 day guided horse riding holiday in the French Pyrenees is an unforgettable authentic experience for the passionate horse rider. The riding is varied and beautiful as you’ll pass through charming and authentic valley villages and discover the rugged and wild beauty of the high mountains. Available from June to September on request. Available also as a women only horse riding holiday. Is this horse riding holiday for me? This is no run-of-the-mill same old same old horse riding holiday. This is a real adventure on horseback and would ideally suit those who are happy to forego everyday luxuries. The accommodation for your 5 day horse trek will be a combination of hostels, B&Bs and even a bivouac/camp up in the mountains. In order to thoroughly enjoy your horse trek you should be used to long days in the saddle. Expect to be riding for between 5 and 7 hours each day. Endurance is therefore key. What are the horses like? Your mount for the trek will be the Castillon breed of horse, native to the Ariege Pyrenees and bred by the stables themselves. This sure-footed, good natured horse has been bred to cope with the rugged terrain of the mountain environment. They are lovable horses and you are sure to get very attached to your mount during your horse riding holiday. If you wish to come on this horse riding holiday you should be aware that the weather will play an important role in your itinerary. Mountain storms can be dangerous so your riding guide will choose a route with your safety in mind. This is an example itinerary which may change at the discretion of the stables. If you have booked an airport transfer we will collect you from Toulouse airport and transfer you to your accommodation for the first night of your horse riding holiday. 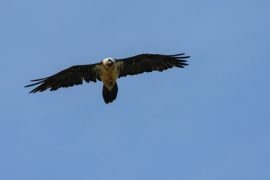 Today’s riding covers some beautiful terrain in the mountains in which you are sure to see some interesting birdlife including vultures, kites and maybe even eagles if you are lucky! From the refuge you will head up to the Col d’Aueran with more far-reaching views of the mountains. 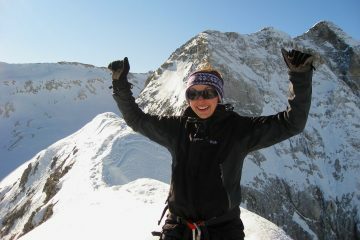 From the col, look up the ridgeline to your left to Pic de Crabere (2629m) which is on the border with Spain. You’ll follow the GR10 in this mountain environment through to the col d’Aurade and a final push up to the Col de la Terme with Pic de la Calabasse (2210m) to your right. The path then contours the hillside beneath the peak to reach the Col de l’Herbe Soulette from where you’ll descend on paths and tracks to eventually reach the village of Saint Lary. There remains a couple of kilometers on paths through the woodland before you reach your overnight stop. After 2 long days it’s time for some gentler riding. Your guide will take you along paths and tracks back down the valley to Castillon. As the crow flies the distance is 17kms but there are a number of different routes that your guide may take you on in order to avoid the roads which will extend your ride. Whichever route you take, you will discover typical Ariegeois villages and farming communities and enjoy stunning views to the mountains. 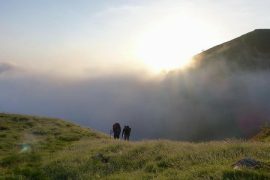 Your overnight will be a stunning spot on the hillside overlooking the Bethmale valley. Here you’ll pitch the tents that have been brought for you and all muck in to cook a barbecue dinner. Today’s ride takes you up the Bethmale Valley taking paths and tracks that meander through woodland and pasture. You’ll be following in the footsteps of the Transhumance, the annual movement of the livestock from the valley floor up to the high mountain pastures. You will spend the night in tents in the beautiful Cirque de Campuls. This is the most beautiful setting where you will be surrounded by Merens horses, cattle and sheep in their natural surroundings. There are a couple of route choices for your final day on the horses. They will depend on how you feel and weather conditions on the day. 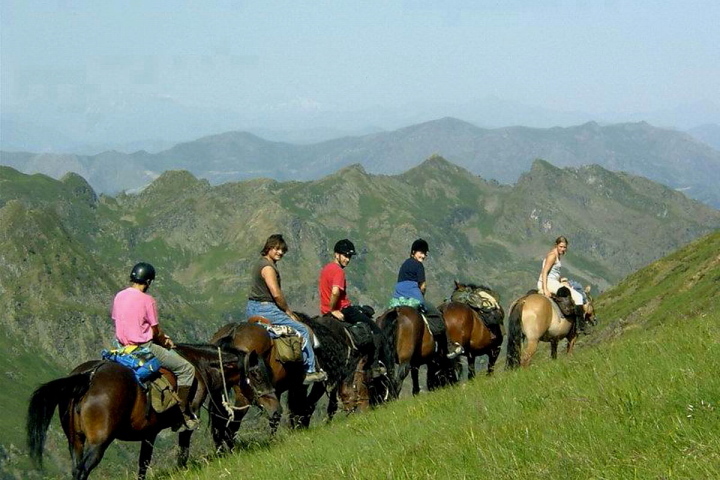 Whichever you take it will be a beautiful finale to your horse trekking holiday. You will no doubt have become quite attached to your companion over the past few days but once you have returned to the stables and unsaddled your horses it will be time to bid them goodbye. You’ll return to your accommodation for a hot shower, a good meal and then a good nights sleep. After breakfast you’ll be transferred back up to Toulouse for your flight home, your camera full of photos and your head full of amazing memories. 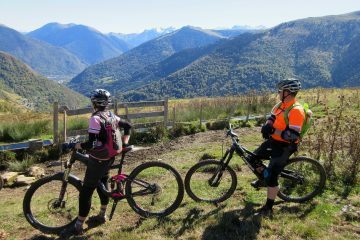 Our horse riding holiday in the Ariege Pyrenees was an absolutely wonderful experience and I’m really grateful to you for all your help getting it just right. We had an amazing time and can’t thank you enough for putting it all together. It was so special to have it all organised – and to be in the hands of such genuine local people at all stages – without the worry of language/money/logistics, worries which can seriously take the edge off a big holiday. And lovely touches like bringing wine for Eliot and I camping and sorting little details like refuge showers and picnics which really made it perfect. And boy was this a big holiday. We have been places and seen things and shared experiences that I don’t think any of us will ever forget. (The children were in barely disguised tears saying goodbye to Willi and their horses.) Thank you SO much.